In Tokyo, it's rainy season from mid June to end of July. Foreign visitors probably think that Japan has four seasons. It is correct but I feel we have five seasons including a rainy season. It continues for more than one month so I think it is long enough to treat as one season. Some of you may plan to ride and see around Tokyo in the season, but if the weather is bad unfortunately, you will need plan B.
I picked up some places where you can enjoy in the case of rain. 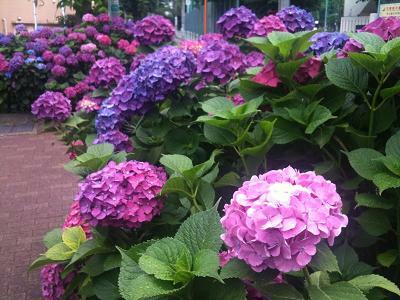 Ajisai is Japanese name of Hydrangea. We like to see the Ajisai blossom in rainy season because it is more beautiful in the rain than under the clear sky. Hase-dera in Kamakura is famous temple for Ajisai. Kamakura is very popular place for a day trip, and it takes less than one hour from Tokyo. Edo-Tokyo Museum in Ryogoku is the museum for learning Tokyo's history and culture. It also serves as a projection onto the city and the living of the future. In Michelin Guided to Tokyo, The museum got two stars. Ramen is one of the most popular local food among Japanese. Ramen museum is a food theme park in Yokohama. They picked up and invited popular ramen shops from all over Japan. In Yokohama, You can enjoy delicious ramen from Hokkaido or Kyushu. 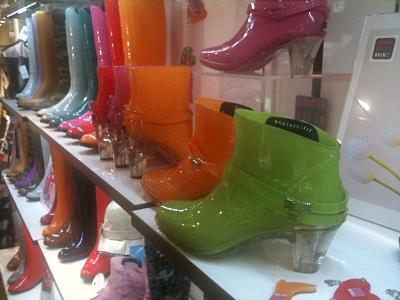 In recent years, colorful and lovely rain boots are popular for young women. Most of department stores sell a variety of rain boots. How about buying a pair of rain boots for souvenirs? But I think that just looking cute boots is enough to make us happy. This page contains a single entry from the blog posted on June 27, 2010 1:31 AM. The previous post in this blog was Bike Manga. The next post in this blog is Added Link : Cycle Kyoto.